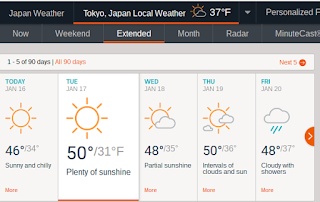 The weather is looking hot in Tokyo, Japan. Hi again Jacob! Wow I think I finally caught up with all your blogs! Excellent work. Thank you for completing this task! Do you know the difference between Fahrenheit and Celsius? I don't know if you're interested, but I have a little story a out the difference if you want to read it. A long time ago, a Polish scientist invented the scale of Fahrenheit, using equal parts salt and water to make the temperature of 0 degrees on the thermometer (which was a 200 year old invention at that point, but he made a new version which used mercury - which made it more accurate). Then he used the average human temperature to make the high point of 96 degrees. And that is how the thermometer was marked so people could say what the temperature was. Sounds a bit strange, right? Celsius, our measurement, was made because a scientist thought 'Fahrenheit is illogical. Salt water, human body heat? What do they have to do with anything? Why don't we just use the freezing and boiling points of something easy, like water?' and so he made ANOTHER scale on thermometers called degrees Celsius! And that's what we use today! So, 0 degree Celsius is when it is so cold that water freezes, and 100 degrees Celsius is when water boils. Cool eh? In Fahrenheit those are 32 and 212. Such random numbers! I know that the website probably automatically went to Fahrenheit because it is an American one, but there will be a button you can hit next time to change it. So right now Japan is actually quite cold. Nearly 0 degrees Celsius. It is winter there. Anyways! Keep up the great work! I hope my little story was interesting! What a fantastic post! 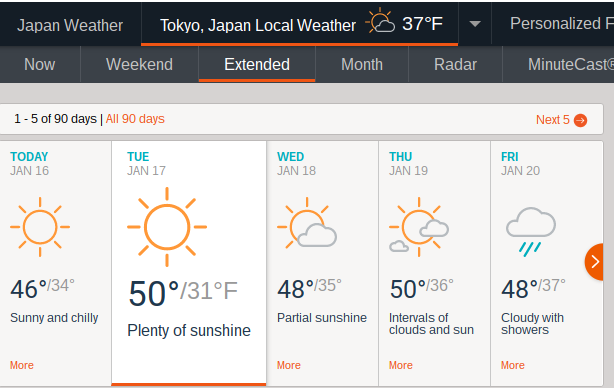 I am glad that I'm not in Japan, as my body doesn't handle high temperatures well! Keep it up! I'm enjoying reading your posts! It's almost the end of blogging so I thought I would jump back on and say thanks for all the great work you put into your blogs. I really wish the very best for this coming year at school, and hope that you face all your challenges head on with a smile on your face. Keep up the great attitude towards learning and taking control of your own success.